I’ve always felt a bit of a bias against buckwheat. Buckwheat was cute, but I was head over heals in love with Alfalfa. Then one day my dad brought home some fresh honey comb from the farmer’s market and I was completely absorbed with this new uber-sweet treat. The combination of the chewy wax and gooey honey along with all those cute little hexagons was so new and exciting. But along side the tray of honeycomb, my dad slipped in a tub of his favorite honey – buckwheat. Well, if he had a favorite honey I was sure it was going to be my favorite too. Oh to be six years old and eager to please! Let’s just be polite and say that buckwheat honey is an acquired taste. Very acquired. Ever since that buckwheat honey incident, I steered clear of anything buckwheat related (well, except for The Lil’ Rascals on Saturday morning television). I passed up diner buckwheat pancakes because just the idea brought back some awful taste memories. But then a bag of buckwheat flour – by way of a moving neighbour – found its way into my cupboard. And I was curious. I had spied some buckwheat cookies over at Orangette and then another recipe popped up at Food Loves Writing and I was more than intrigued. Hmm, maybe it was time to give buckwheat another shot. So I did a bit of research and it turns out buckwheat isn’t related to wheat at all but is more of a cereal, which means it’s gluten-free. As for the honey, well, buckwheat honey is still gross. But the flour certainly isn’t. I tried it out using my standard pancake recipe and it passed with flying colours! And while cookies seemed like a good choice, it was a weekend morning and I wanted to bake up some scones for breakfast. That buckwheat bag was staring me in the face and so I went with it. Maple and walnut seemed like a good compliment to the heady buckwheat and it was. The scones were delicate and not too sweet and were so nice eaten warm and smeared with cold butter and a thick layer of sour cherry jam. Buckwheat, you’re not so bad after all! elsewhere: Looking for an easy brunch or dinner idea? How about a crustless quiche? Over at Poppytalk I make a broccoli and feta version without bothering with crust. Perfect! Preheat oven to 425F. In a large bowl, whisk together the flour, baking powder, and salt. Add in the butter and use your hands to work it into the flour until you’ve got oat-shaped bits spread throughout the mixture. In a separate bowl, combine the milk and vinegar, along with the egg. Stir well until mixed. Pour all but a tablespoon into the flour along with the maple syrup and extract, and walnuts. Stir with a wooden spoon until a dough forms. Sprinkle a clean work surface with a bit of flour and turn out the dough, kneading for no more than 12 times. Pat dough into a round shape, flattening it with your palms to 1/2 inch thick and cut into 8 wedges. Place on a baking sheet covered with a Silpat or parchment and brush over the leftover milk/egg mixture. Sprinkle with raw sugar, if desired. Bake for 10-15 minutes or until golden. Cool on a wire rack and eat warm or cold. I actually started experimenting with buckwheat (and other grains) largely thanks to Good to the Grain. But have since not looked back. Buckwheat pancakes are so incredibly delicious. Must try these scones one morning. You’re killing me! 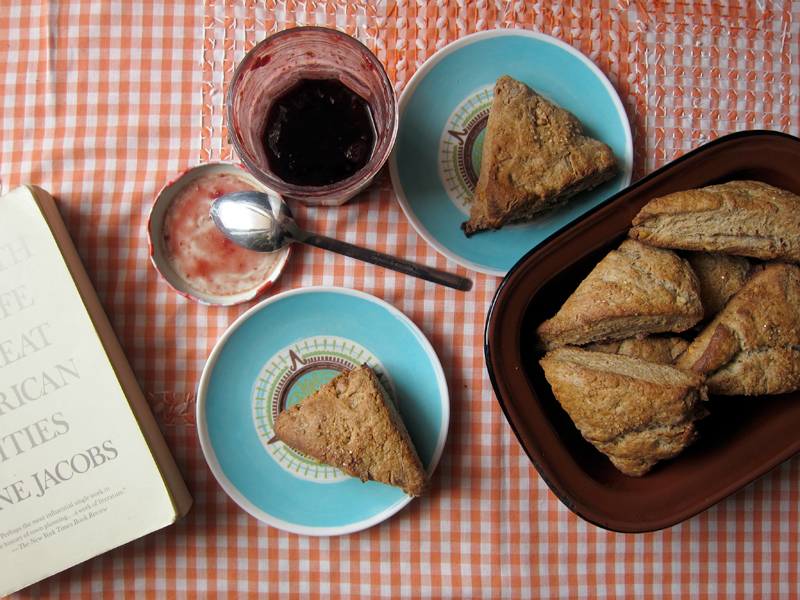 Scones are my weakness, especially if they’re airy and crumbly. Buckwheat is near the top of my honey list, along with chestnut and mesquite. And anything with maple and/or walnuts is near automatically great. So many positive attributes! Goodness gracious! I love buckwheat *and* I love scones. You just made my mouth water. LOVE the sound of these. I used to be addicted to Starbucks’ maple walnut scones (don’t judge me!) and these look like a much healthier version. 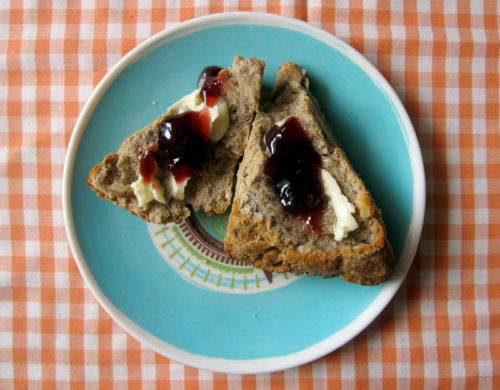 The picture with the jam is super helpful too – you never know what the insides will be like, but you can see these are nice and soft and tender. Excellence. These look so good. I love the nuttiness. Would taste great with homemade triple plum jam. I can’t believe I’ve never cooked with buckwheat but I have to try this recipe. I’m fairly certain I’ve only ever had buckwheat in the form of pancakes and other than that, I wouldn’t know what it looked like if it hit me over the head! The scones sound delicious though…I’m glad you found a good use for this grain! I have never baked with buckwheat before, but this looks like a great way to try it. Scones are a favorite in our family! Thanks for sharing. I used to make buckwheat pancakes back in the 60’s when everyone ate buckwheat all the time! These look wonderful, I’ll have to give them a whirl..
i remember my mom making buckwheat pancakes when i was a kid. i too, was not thrilled by the flavor of buckwheat then, and having a family of fairy picky eaters have not tried it again either. maybe i will give it another try someday soon too. Kasey, I so want that book! My birthday is coming up so I’ll put it on the list! Heather, these sound just perfect for you. And I’ve always wanted to try mesquite honey! Zo, I’ve never had their scone but I don’t judge! Emily, they’d be perfect with any homemade jam i think! Though, I do love my sour cherry Bonne Maman preserves! Yes, Dandy, it’s a nice switch! Give it a go. Joanne, try it out, I’m sure you’d love it. 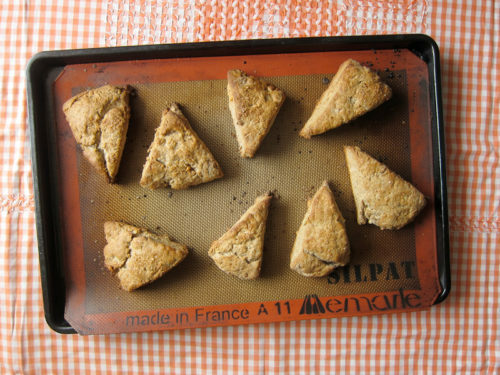 Scones are always a fave, Rivki! RMW, I know buckwheat sounds so hippy but it’s so good. I’m glad it’s on an upswing! I’d suggest giving it another try, Cindy. Taste buds change! I used to make boiled Kasha(buckwheat) with butter and sauteed onions for my Polish other half. Then I saw that buckwheat comes in a flour version and started making buckwheat pancakes and muffins and cake. Sometimes it was a hit and other times it flopped. Nevertheless I love the taste and texture of buckwheat and I bet these scones are the cat’s meow with some butter and jam (or honey). I’ve never tried Bonne Maman cherry preserves as of yet and I love cherries! Must change that. Oh it makes me soooo happy that these are gluten free! Glad you started trying out with buckwheat again. I know what you mean about dad’s slipping in things…trying to get away with it. My dad did it with stir fried frogs (chinese dish)…it was yummy, like chicken…until I found out… let’s just say it wasn’t a very pleasant evening. I really enjoy your recipe blogs and tried your cucumber salad last week, but this one is going to be a definite addition to the post-it notes because, although I’m not gluten intolerant (according to blood tests) I feel so much better when I stay away from Wheat and buckwheat sounds like the next best thing! Ooooh! I haven’t baked with buckwheat in a long time, but these look amazing. My sister has Celiac Disease, so her diet is entirely gluten free – I’m sure she’d appreciate these. What does buckwheat honey taste like? After a quick Google, all I keep coming up with is buckwheat honey as a cough syrup substitute… which doesn’t sound very appetizing! I’m just dying to try some kasha, Bijoux. Next on my list! Vicky, yikes, frogs legs are quite different from honey! Though I do think I tried rabbit as a young kid and was told it was chicken. Thanks Joanne – yeah, that salad is a good one. And give buckwheat a try! Christine, buckwheat honey is very strong! It’s been ages since I’ve tried it, but it is pungent. What is it with people giving away buckwheat flour? I just got some a couple of weeks ago from someone who bought it by accident and assumed I would know what to do with it. Now I do! These look wonderful. Ive never cooked with buckwheat before but those yummy photos have convinced me to change this! I do find it hard to believe that buckwheat honey is icky though.. How can honey be icky? Yummo! Scones are so my Achilles heel. I may or may not have had scones for breakfast this morning. How funny, I just bought buckwheat to make Gwyneth Paltrow’s cookies and I’ve never used it before. I am now more excited to try it! Your scones look wonderful and I appreciate the ideas for what to do with the leftovers. This may be a silly question, but I’ve always wondered what to do with honey combs. You eat them? Wax and all? Lucy, my dad is a fan but I do think it’s an acquired taste. I have no problem with most honey or molasses, but buckwheat is a different kind of beast! Scones for the win, Claire! Nicole, enjoy playing with buckwheat – it’s also great in pancakes. I only had honeycomb that one time and I loved chewing on the wax, but I don’t think I ended up eating it. Chewed it like gum! Mmm, just made these (and a savoury cheese & chive verson). Even though I screwed around a little with the recipe a bit it turned out great. Love how nutty and crunchy they are but still nice and soft on the inside. What a keeper of a recipe! Thanks again. Zo, glad you tried these! Yes, I’m sure these are super versatile. I have never baked with buckwheat before..you have inspired me! Ooh! What a delicate way to use buckwheat. Buckwheat pancakes are too heavy for me, but in a buttery, flaky scone? How delicious. Also, do you have a recipe for that sour cherry jam, or is it a very simple jam of sour cherries + sugar + pectin? Matthew, try buckwheat – you might like it! Sharolyn, thanks for your comments. You may want to use half buckwheat and half all – purpose flour in baking. The flavour would be less pronounced. As for them being hard, I didn’t experience that at all, so it’s hard to say what went wrong. And if you’re afraid of baking, just sub some buckwheat into your favorite pancake recipe! Ooh, buckwheat is one of those flours I’ve had floating around in my cupboard for ages, with no idea what to use it for! These sound gorgeous, and I love the flavours of maple of walnut – thanks for this recipe! Added a little white sugar, these were great. The vinegar is very necessary – I used twice as much actually – it acts on the buckwheat (in case it seems weird to anyone else…). Thank you for sharing. Adding it to my ‘scones’ file! Anna, now you’ve got a recipe or two (pancakes!!!) Enjoy! We tried these today, thanks for the great recipe! Flavor is fantastic, my young boys love them. Any idea why my buckwheat flour turned black when liquid was added? No nutty brown color here, just extra-dark, almost black scones! Crazy looking but great tasting! Hmmm, that’s odd Brooke! I don’t have any explanation – did you let the mixture sit for a bit? I’m glad the scones tasted good even though they were strangely dark! Made these today. Did you really only use buckwheat? I was skeptical because I’ve incorporated buckwheat flour in baking for many years and in order to get the lift/fluff that is desired in some goodies such as scones, other flours need to be used along with the buckwheat. I tried these regardless of my doubts and they came out (as I suspected) very dense, flat and crumbly. I think 1/2 buckwheat with either an all-purpose or alternate gluten-free flour might work better. Laurie, I’m going to re-make these and adjust the recipe. Thanks for letting me know you had issues.